Thanks for checking out our upcoming events! We are gearing up for the fast approaching Maple Sunday to be held the last Sunday of March statewide. 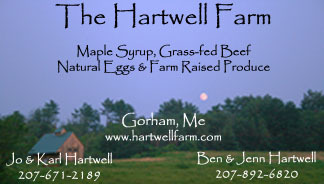 Please consider us in your farm tours and stops for Maple Sunday. We offer a unique timber framed Sugar House, and a wood fired evaporator. Enjoy the smells of the wood fire mixed in with maple steam for a very nostalgic experience. See how Syrup is made, learn about how we collect it, and try some free samples. We offer ample parking roadside and also if the ground stays firm, off road parking as well. Have a family member that needs a lift? We are happy to offer our golf cart service to shuttle those needing special help from your vehicle to the front doors of the Sugar House. Please enjoy your visit, and give us a call or email. Maple Sunday coming! Join us in March for our annual Pancake Breakfast! 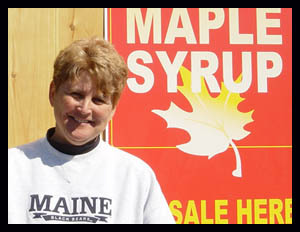 Nothing beats farm made cakes drizzled in Maine made Maple Syrup. Can't make breakfast? Join us for lunch when we serve up our own Sebago Lake Ranch, all natural, Grass Fed beef. A fun filled day for the family, sampling syrup drizzled ice cream and other farm products. All content subject to copyright © 2010-2014 Attitudes By Design.